The Basenji (meaning “small wild thing from the bush”) is generally recognized as a pariah or primitive breed. It is unique in many ways, most notably for the inability to bark. Some mistaken this to mean that the Basenji makes no sounds, but they still growl, howl, and yodel. They will also wrinkle the fur on its forehead when it is alert, and groom itself much like a cat. As with the Dingo and other wild dogs the females only go into heat once yearly. Originally the Basenji was kept by African tribesman for both hunting and as a watchdog. Traditionally they work in small packs to hunt game such as antelope, monkeys, and wild cats. They use both sight and scent to find their prey, instead of just one sense. A versatile hunter they were used to point, retrieve, drive game into nets, and track prey that was wounded. The Basenji is one of the oldest breeds of dogs. Recent DNA testing has shown they are amongst a handful of breeds closest in relation to their wolf ancestors. Dogs similar to today's breed can be found on the walls and tombs of the Egyptians, as far back as the 4th dynasty – 4,500 years ago. These ancient dogs were known as the Tesem. They are believed to be the ancestor of not only the Basenji, but also the Africanis of South Africa. Over the centuries they spread across Africa, becoming highly valued by the African tribesman. Once ranging from Egypt and Sudan in the northeast and to the Congo basin in the west. 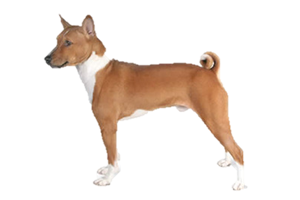 It was in the Republic of Congo that the history of the modern Basenji begins. Having been discovered by Europeans in 1895. Early attempts to bring the breed to England were a failure. The imported dogs died of disease foreign to their immune systems, such as distemper. A successful breeding program was not established in the United Kingdom until Olivia Burn obtained samples in the 1930s. The Basenji would not arrive in the United States until 1941. Unfortunately, both the American and European breeding pools suffered heavily after WWII. Already small by having only a few imports, dogs were imported from Sudan into Europe in the 1950s. In the late 1980s more dogs were brought to the United States. This last group included brindle, red, and tricolor dogs. Thus, introducing the brindle gene to the outside world. As recently as 2009 the American Kennel Club opened its studbooks to allow entry for additional imported dogs. Which diversified the gene pool and increased the breed’s overall health. The studbooks were once again closed in 2013. Today the Basenji can still be found in remote areas working alongside tribesmen in their traditional roles. Elsewhere they have settled into the role of valued companion and show dog. Is the Basenji Right for You?